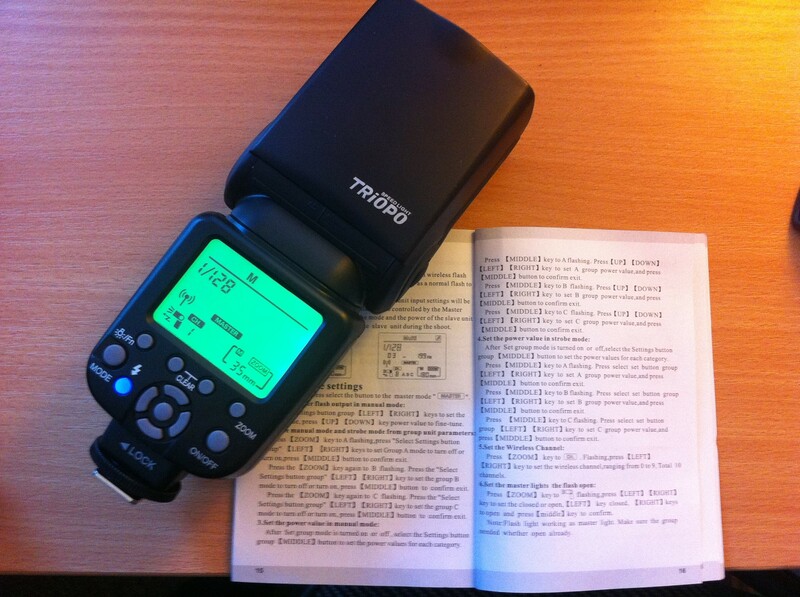 Triopo TR-850EX 2.4GHz flashgun review – the poor man’s 600EX-RT? The TR-850EX has a built-in radio transceiver that triggers and controls other flashes. Is it any good? 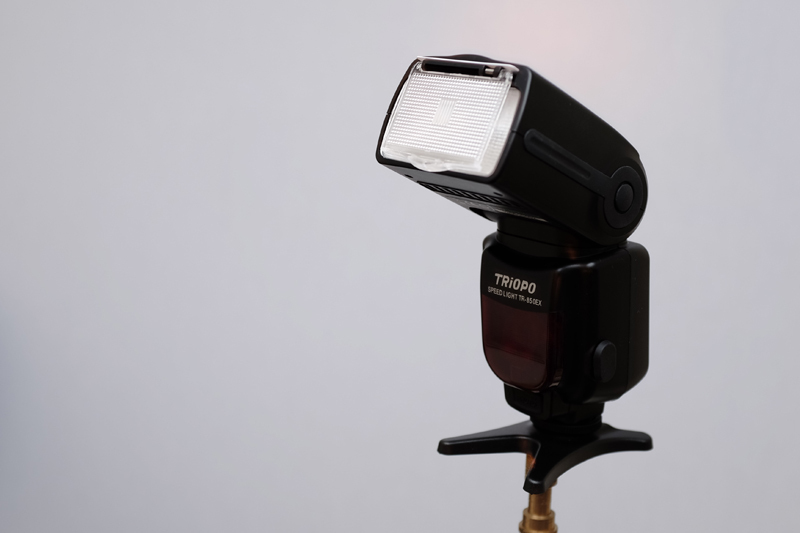 Triopo sent us a pair of their new TR-850EX Speedlights to play with. These are cheap manual flashes with built-in 2.4GHz transceivers. Each light can be used to command and control others, allowing you to set up your photo-shoot without having to walk back and forth to adjust settings. Unlike Canon and Nikon’s proprietary flash protocols or third-party TTL radio triggers, the TR-850EX is actually a self-contained system that doesn’t depend on what camera you use. This could potentially be a game-changer for photographic lighting, bringing studio-style wireless control to non-dedicated shoe-mount flashguns for the first time. Other companies, including Pixel Enterprise and Rikon, have hinted at radio-enabled flashes in development, but haven’t got anything to show for it yet. So, has Triopo’s first foray been worth it? Is the TR-850EX any good? NB: Triopo also has an E-TTL version, the TR-860EX, but that’s not being tested in this review. From first impressions, the TR-850EX looks and feels like many a Chinese flashgun. The flash head has a firm movement to it — though it doesn’t lock — while the rest of the device feels OK in the hand, if a bit plasticky. The controls provide a firm and reassuring click with each button press, and the centre D-pad is slightly recessed so you won’t change settings by accident. The battery door is probably the weakest component; it feels like it’s constantly about to break. Set this flash to work, however, and its functions are almost completely unique from anything else currently on the market. The reason for this is built-in radio control. The level of technology sits somewhere between the Canon 600EX-RT (which is very advanced, very expensive and only works with a select few advanced expensive DSLR cameras) and the Yongnuo YN560-III (which is less advanced and cheaper). One TR-850 can act as a master unit, controlling three groups of remote flashes from up to 50 metres away via invisible radio signals. You can adjust the power levels of these three groups of flashes independently of each other, and the master flash can choose whether or not to put out light, too. The master flashgun doesn’t care which camera it is sitting on (so don’t be fooled by the Canon E-TTL pins on its foot: they are redundant) and indeed doesn’t need to be sitting on a camera at all. The benefits of this are two-fold. Almost any camera can be used so owners of low-end DSLRs and less popular brands such as Pentax or Olympus needn’t feel left out. You can mount the master flashgun off-camera (triggering it with a separate radio trigger, sync cable or the test button) if you don’t want the weight in your hands. 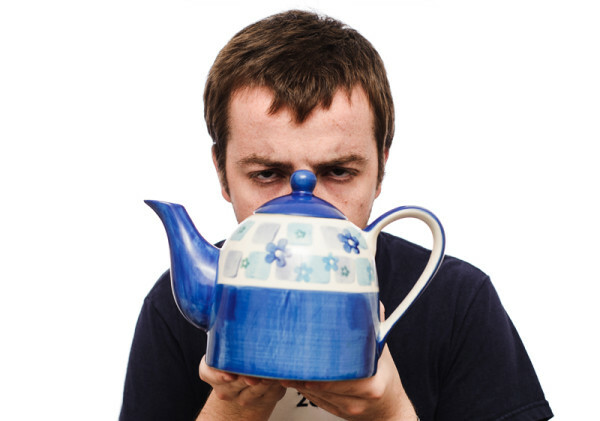 Controlling the system is easy enough, if not immediately intuitive. With a little bit of practice, you can very quickly adjust the parameters of your whole flash setup, including power levels, zoom, channels and modes. The settings are displayed on the flash’s backlit LCD, which is crisp, legible and bright, though possibly a bit fragile. Basic manual control is simple enough, with ⅓-stop control of the power down to 1/128, plus zoom adjustment from 24mm to 180mm. Pulling out the diffuser panel doesn’t auto-zoom the TR-850EX to its widest setting, so you’ll need to do this yourself. One other minor irritation is that the slave flashes always match the zoom setting of the master. 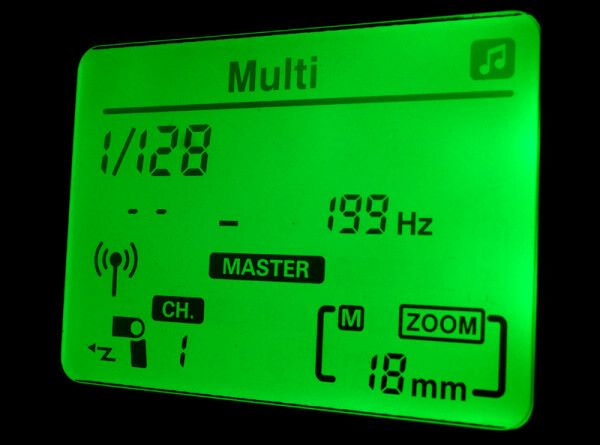 The TR-850EX also offers a strobe or “Multi” mode. It’ll give you up to 40 flashes from 1–199 Hertz. So how do we actually go about configuring our 2.4GHz wireless flash setup? You’ll find the instructions on page 15-16 of the user manual. This tome is an eye-straining omnishambles, definitely not for the faint of heart. Even after just quickly skimming through I had to have a lie down afterwards. Fortunately, the flash is much, much easier to use than the handbook is to read. After you’ve gone through everything step-by-step you can get the hang of it in half an hour or so. This is in contrast to the Genesis SP-692, which is appalling to use at all times. There could be one or two improvements to the interface, such as labelling the buttons a bit more sensibly and having a screen that displays all of your groups’ settings at once. However it’s a solid attempt for a first-generation product. “Left Right Up Down Zoom Left Right Middle Zoom…” Are these cheat codes? The recycle time matches the manufacturer’s spec of 2.9 seconds at full power, and much quicker at lower power settings. The ready beep comes in handy, is very loud and makes everything seem that little bit more professional. Of course you can switch this noise off if you find it annoying. At full blast, the light output is ⅓-stop under that of the LumoPro LP180. Pretty decent. From shot to shot the TR-850 gives consistent exposures, unless you try to fire it before the capacitors have charged properly (note that the circuitry will not prevent you from doing this). Keep the beep enabled if want to be sure when it’s ready to fire. The synchronisation speed is distinctly average. I will get black banding in images at 1/160 second or above, even in M mode with the flash mounted on the camera. The performance is no better with a compact camera like the Fuji X100S (which can normally sync up to 1/4000 second with just about any flash). This could be a huge let-down for photographers wanting something super-fast to use on location photo-shoots. On the other hand, in the studio and at night it doesn’t really matter. In theory, you can create highly sophisticated multi-light photographs using a studio case full of TR-850EXes. We were working with just a pair of flashes (kindly sent to us by the manufacturer — cheers Triopo!) so opted for something a bit less ambitious with what we had: one master and one slave. 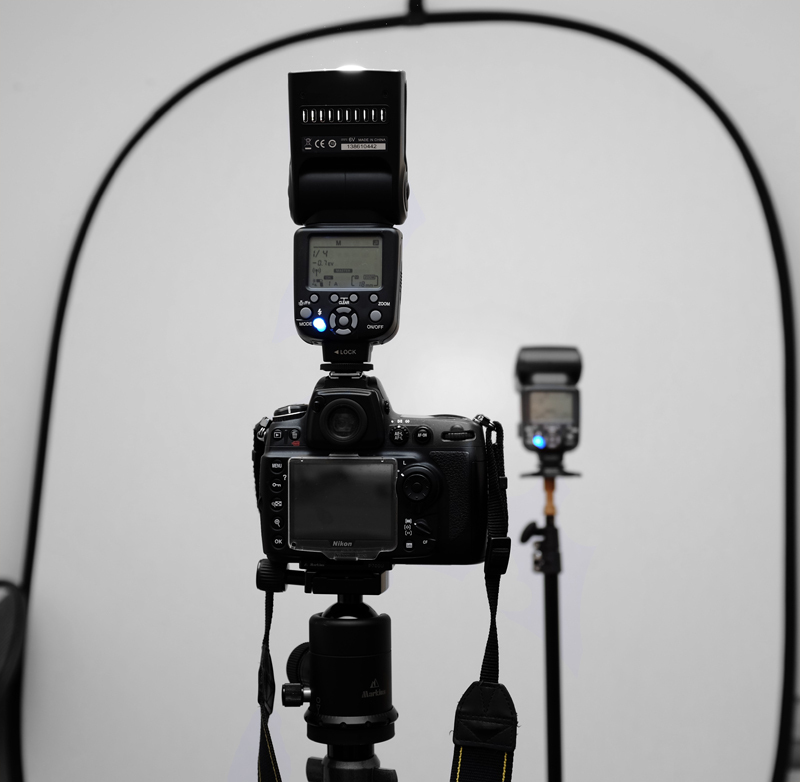 The following photo has the master TR-850EX on top of the camera (a Nikon D700) bouncing light off the ceiling, while a second TR-850EX, a radio slave, is directly behind the subject pointing at a white backdrop. It was really easy to adjust the lights independently of one another to get the correct exposures from the main and subject lights. Metering them separately is also possible as you can toggle groups (including the master ‘group’) on and off with just a couple of button presses. Each flash had plenty of power for the job. I had high hopes for the TR-850EX while simultaneously expecting it to be awfully executed and poorly built. In the event, I was pleasantly surprised. Yes, the interface could do with a bit of work, but it’s not all that bad. Build quality is OK, except for the LCD. The instruction manual certainly needs a rewrite, but the flash itself works and does what it’s supposed to do in a reasonably efficient manner. Performance-wise, recycle time and brightness are on par with the competition, though the synchronisation speed is mediocre for location work. I’d like to see a low-profile unit produced (in the style of the Canon ST-E3-RT) that people can use as a radio controller if they don’t want a heavy flash on their camera. A basic radio receiver, to add third-party flashguns to the mix, wouldn’t go amiss either. With these improvements, I can see Triopo flashes making big (radio) waves! All in all, it’s a good start. We’ll be watching closely to see how the system develops. The Triopo TR-850EX costs about $70, available now on eBay. If you spot it on sale anywhere else, be sure to post details in the comments below. For more information on Triopo, visit the manufacturer’s web site. What do you think of this system? Could you see yourself adding it to your camera bag?